This week I had the pleasure of being in Santa Fe, New Mexico. In addition to watching cactus bloom, eating incredible red and green chile, listening to cicadas zip, chirp and zing, and taking in the smell of desert rain, I’ve also been participating in the Currents International New Media Festival. One of my favorite events of the year, it is an opportunity to spend time in my New Mexico homeland, share work with the community, and meet incredible artists from around the world engaged in the discourse between art and technology. The growing number of familiar faces back for their second, third or even eighth year is a perfect indication of what a community fostering event Currents truly is. 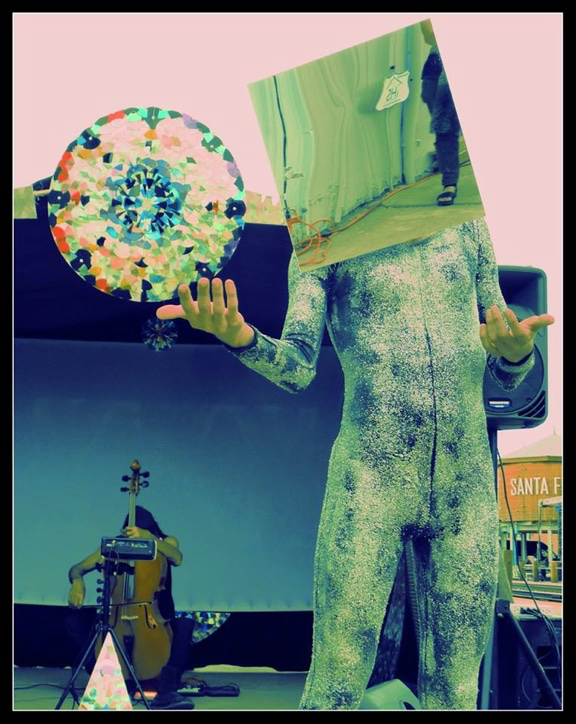 Each year it grows and matures, yet it somehow maintains its core values of connection, community and sharing new art with the public. If you are not familiar with Currents, here is an interview with Frank Ragano and Mariannah Amster, the founders of Currents, that I did several months ago. You can also find out more on their website currentsnewmedia.org. The bulk of the festival takes place in the roughly 30,000 square foot warehouse building at El Museo Cultural de Santa Fe, but there are concurrent exhibits in nearby galleries, cinemas, local arts organizations, and other partner venues all across town. This year there are around 100 different works from almost as many artists ranging from single-channel fixed media video works to VR, robotics, holography, digitally fabricated objects, performance, interactivity and large scale immersive installations. There is a lot to take in and always more than can be seen by any one person, but here’s a taste of what I took in on opening weekend. CelloCosmos, Michael Kott. Kott, left, and Colton White, right. Photo courtesy of Urszula Bolimowski. 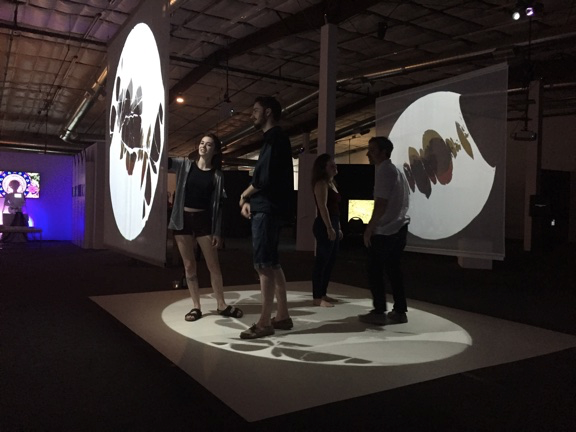 When the festival opened at 6PM, I was already inside, scrambling to put the finishing touches on my own work - Vesica Pisces, a VR collaboration with David Stout and Reilly Donovan. People rapidly began filling the building and by the time I got out to the main space, there were hundreds of people diving in. 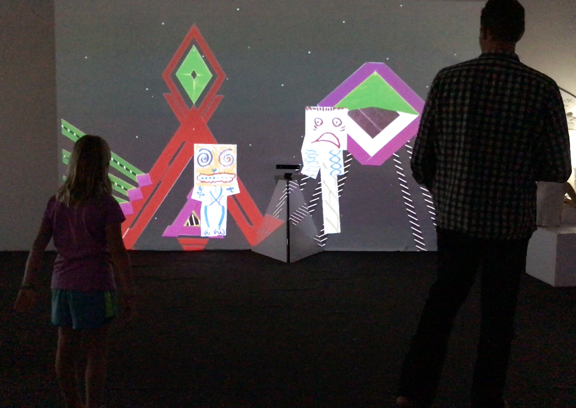 The couches placed in front of installations were full, queues had formed at all 5 of the VR pieces spread throughout the building, and children were puppeting self-drawn avatars in front of a Kinect. BabaBodyPaint, Babadoom Berlin. Image courtesy of Andrew Edwards. But for those waiting, there was no lack of other material to take in. A crowd gathered in awe around Jacob Tonski’s sofa, perfectly and tenuously balanced by a gyroscope on one leg. Shifting and swaying almost imperceptibly to maintain equilibrium, it remained upright for the entire evening. Balance From Within, Jacob Tonski. I joined another group nearby and ogled the perfectly still floating bubble in Verena Friedrich’s The Long Now, waiting for it to burst. When it finally did, another was mechanically blown into the small box, frozen in midair and elevated by the offgassing dry ice at the bottom, and the cycle continued. Throughout the space various video works equipped with IR headphones gave audience members a personal and intimate viewing while blocking out the sound from neighboring installations and the music filtering in from outdoor performances. I have only seen a few so far, but a standout for me was Peter Nelson’s On Dying. The voices of elderly persons telling their stories of loss issue from the mouths of youthful actors, their faces perfectly mimicking every twitch, grin, smile and grimace. On one hand a meditation on how we look at death and dying as a culture and on the other a poignant reminder that youth is fleeting and that our elders voices need to be heard. Another highlight was Robert Campbell and Babette Pendleton’s, Solastalgia. A one-hour long speculative fiction tour-de-force, this is not to be missed. Breathtaking composites of Italian architecture and landscape create a sublime and picturesque but often haunting backdrop, while various dancers (choreographed by Pendleton) and actors and strange digital artifacts create live action tableaus. Solastalgia, Robert Campbell & Babette Pendleton. Photos courtesy of Robert Campbell. In a nearby room was SV+VS (Sonifying Visuals / Visualizing Sound), a collection of works selected by guest curator, Yoon C. Han. 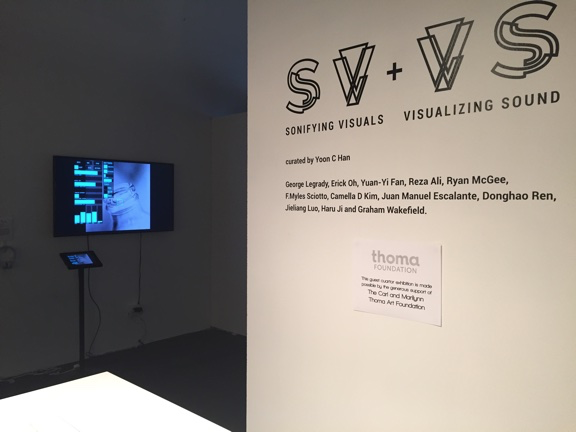 Sponsored by the Thoma Foundation, this sub-exhibition focused on a variety of techniques for transcoding image and sound. Ranging from interactive works that create music based on collision detection of virtual objects to digitally fabricated representations of waveforms as sculpture, the selection gives audience members a chance to learn about this fascinating subject from a variety of perspectives. In the midst of all of the installed works were a variety of performances. I caught a few moments of Colton White’s, We, an in-the-round piece performed in the main installation space. 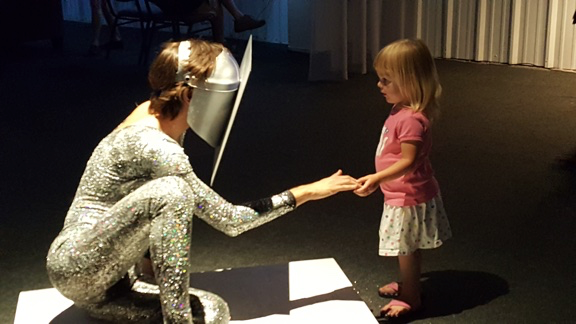 Bedazzled and adorned by a helmet with large square mirror fixed to the front of a facemask, White danced and engaged with unknown audience participants, neither ever quite sure who each other were. We, Colton White. Photo courtesy of Sarah Rosenthal. Meanwhile I was missing indoor and outdoor performances. 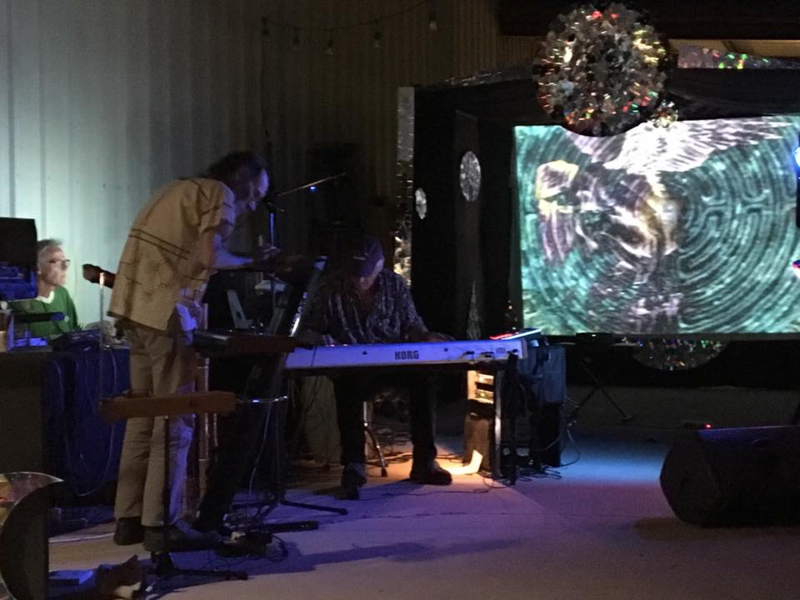 Outside featured live music by Rampant Ego and images by Lynn Augstein & Rubicon Arts in the Quasar Lounge, a performance, music and projection space designed by Urszula Bolimowski. Inside, VOSIS, brought in by Yoon as part of SV+VS was performing on the main stage using a sonification system that created wavetables by analyzing image data (unfortunately I didn’t get any pictures). Rampant Ego at Quasar Lounge, left to right: Dwight Loop, Justin Parker, Arnold Bodmer. Photo courtesy of Rob Thomas. Saturday and Sunday I sat it on the artist talks. The theme was An Artist’s Path to New Media and gave some nice insights both to the work on display and to how different artists fit into and define the umbrella term New Media. 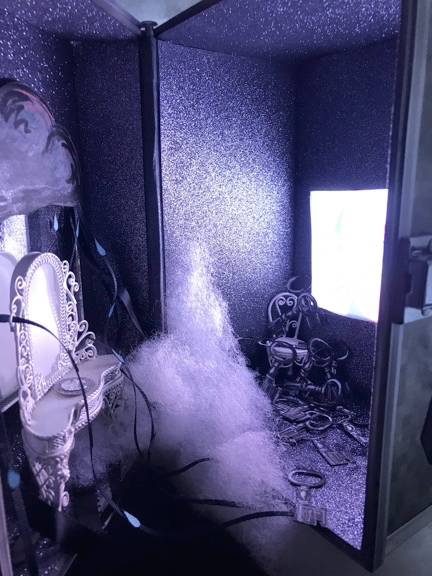 It started off with Sarah Stolar, whose work Cloud: Perfect (Reprise), is the latest in an ongoing series of pieces that create miniature scale dioramas with meticulously crafted electronic elements to address issues of internal versus external identity. Cloud: Perfect (Reprise), Sarah Stoler. Photo courtesy of Andrew Edwards. Nadav Assor talked about bridging ideological and geographical gaps with technology. 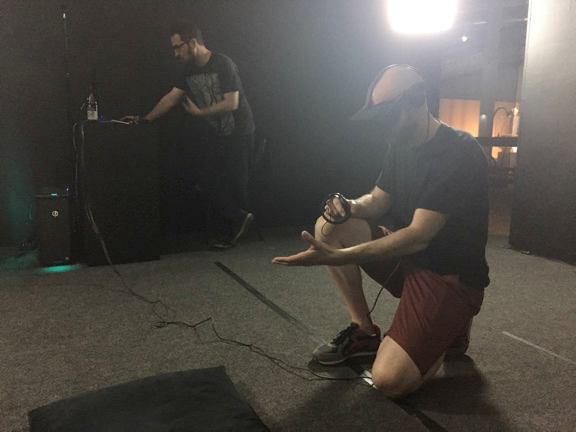 I later had a chance to experience his VR piece Titchener’s Cage / Out Of Body Experience Machine #2. 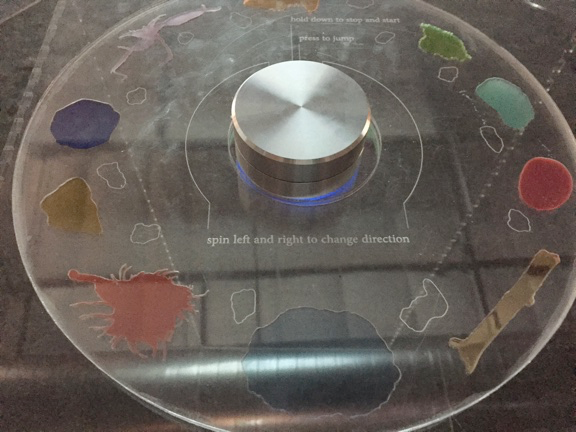 Made using Max, the piece lets you listen to and watch the recorded point clouds of viewer/participants from various locations around the world in which the work had already been installed. 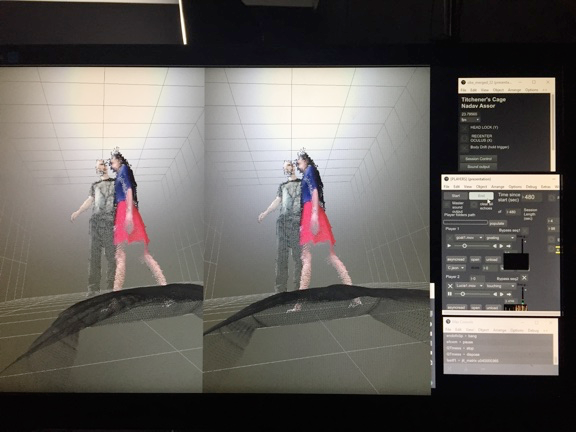 Users own point clouds are projected into the environment and they have the open of “leaving their body” and viewing themselves within the scene. Titchener’s Cage / Out Of Body Experience Machine #2, Nadav Assor. 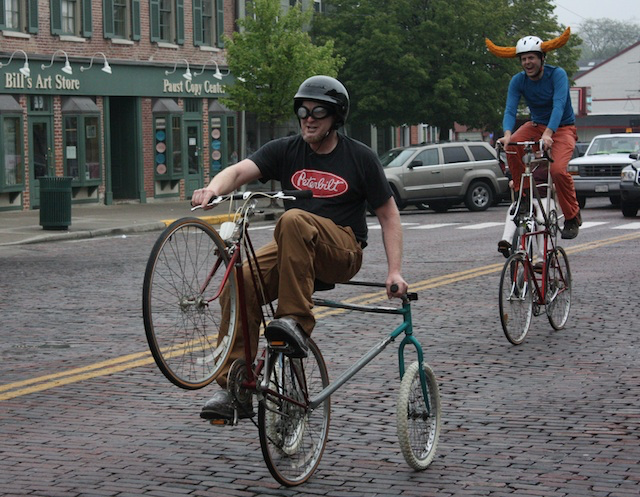 Jacob Tonski (Balance From Within) got us all laughing and gave some insight into his earlier kinetic sculptural works, including a permanent wheely bicycle and a double decker made from his mother’s and father’s bicycles. 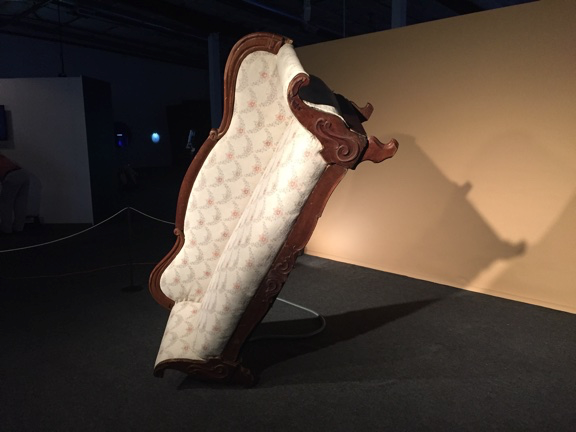 Kayla Anderson addressed OOO (Object Oriented Ontology) as a central and guiding tenet in her work, much of which places the human character in a world where their agency is slowly given over to other objects. Her work for the show, SetOutputWorld (called with a world of the wrong size), is an interactive mythopoetic work in which found objects have grown to become an entire landscape. The piece got its title from a coding error she encountered on another project. Interface for SetOuputWorld, Kayla Anderson. Kendra Fleischman spoke on the journey from traditional sculpture in stone and brass to new media through the lens of B-movie science fiction. Her work Little Chapel Of Our Holy Mother Board hones in on her interest in communication and the benefits and perils of communications technology. 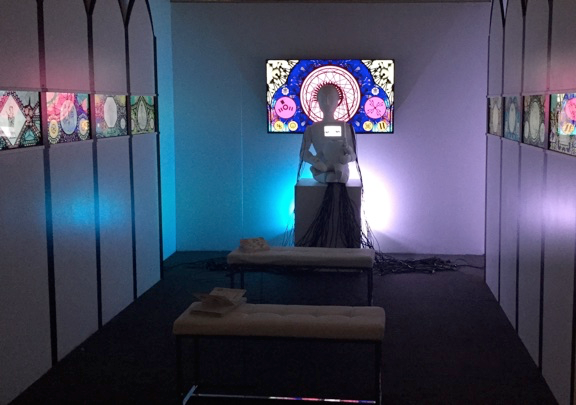 The whimsical but somewhat haunting chapel features “stained glass windows” made of 9 synchronized monitors that poke fun at our worship of technology. Little Chapel Of Our Holy Mother Board, Kendra Fleischman. Last to talk was David Stout, co-founder (along with myself) of NoiseFold. Stout focused on the idea that new media is the natural outgrowth of varied interests and has always happened as new techniques and technologies become available. He also spoke about how his early childhood living on a ranch in rural Oregon shaped much of his artistic practice and inquiry. One thing that really stood out to me was his recollection of attending his first cattle auction. The affected quality of the auctioneer's vocal style and stage presence made a profound impact on him both sonically and performatively. One of the things I love about artist talks is that you can always learn something new no matter how well you know the speaker. This is the 8th year of the Currents International New Media Festival. As it has every year, it left me inspired, humbled, and exhausted. Inspired by the incredible range of exploration in art and technology; humbled by the overwhelmingly positive reception by the community and of the open and sharing spirit of the artists, interns, volunteers and organizers; exhausted by the sheer amount of human interaction and taking in of art. I feel truly honored and blessed to participate and attend and hope that the festival will be here for years to come. Currents continues until June 25th, so it’s not too late to make it in. For a full schedule and to find out more about the organization, artists and works, see currentsnewmedia.org. Finally, Currents puts out an open call for submissions every year, so keep your eyes peeled and maybe you can join in the fun.